On 12 February 2016 at 3pm, the lost Purple Heart of Vietnam Hero SP4 Craig E. Hampton was returned at his home in Hesperian, CA. Specialist 4 Craig E. Hampton was born in August of 1946. He would later enlist into the United States Army and served from 28 February 1966 to 24 January 1969. He served in a well-known unit, Company B, 1st Battalion, 7th Cavalry Regiment, 1st Cavalry Division. One might be familiar with the movie “We were Soldiers, Once and Young” with Mel Gibson, which depicts the same unit he served with. During Operation Paul Revere IV, elements from his unit were conducting extensive search and destroy missions in the areas of Chu Pong and the Ia Drang Valley in Vietnam as well as the Cambodian Border. It was during this operation, on 12 November 1966, Specialist 4 Hampton was wounded in action. For his actions and service and Vietnam, he was awarded the Purple Heart, National Defense Service Medal, Good Conduct Medal, Vietnam Service Medal with 2 Bronze Service Stars, Vietnam Campaign Medal with 1960 Device, Republic of Vietnam Cross of Gallantry with Palm Unit Citation, and the coveted Combat Infantry Badge. 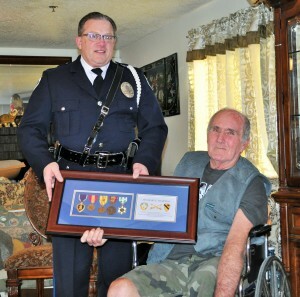 Purple Hearts Reunited was first contacted by Detective Michael Brennan from the Madison, Wisconsin Police Department on 19 January 2016 with the news of the medal discovery, which was found affixed to an abandoned backpack in Madison. Detective Brennan, himself a Veteran and Gold Star Father, understood the importance of the medal and worked tirelessly with Purple Hearts Reunited to find the family. Both Detective Brennan and the Founder of Purple Hearts Reunited, Zachariah Fike, traveled from Vermont and Wisconsin to personally return Mr. Hampton’s Purple Heart.